our Young Adults ministry is for college students and single-working adults under the age of 30, and as diverse as our group is, we have a lot in common. During the year we have a Grow Group that meets at various locations across town (restaurants, parks, homes…), on Sunday Nights at 6:30pm to discuss scripture and topics of the group’s choosing. 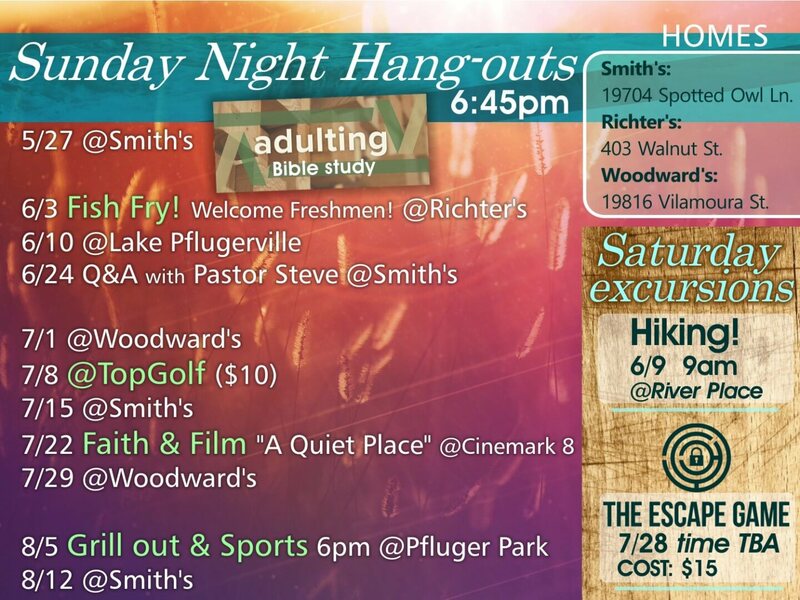 During the Summer season, when many of our college students come back into town, we’ll have a packed summer with hang-outs, service projects, and fun outings (Top Golf, Hiking…). We know that you might have a “home” church when you are off at college, but we are happy to be here when you need us and tether you throughout the year. Be sure to check out the video below of our Disaster Relief trip to Wimberley in 2015. And if you friend-request Daniel McGinty on Facebook, he’ll add you to our group. Service trip: If a DR event comes up and it works with the schedule, we’ll deploy!